1974 AD is a National Nepali rock band, formed in Kathmandu, Nepal in the early 1990s. 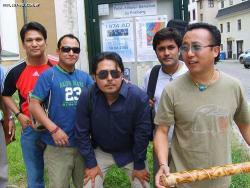 They experiment with various genre of music including Nepali folk, ragas, rock, funk, blues and jazz as well. 1974 AD are amongst the most successful recording artists in Nepal. Most of their albums are ranked among the top-ten best-selling albums according to the Hits FM of Nepal. Their concert name being 'Rock Yatra,' in 2000 AD was watched by more than 60,000 people, the largest attendance for a concert in Nepal. Songs and albums produced by 1974 AD are usually in the Nepali language. Lyrics include themes of patriotism, Nepali virtues, unity, love and nationalism. There is a lot of variety in the music of 1974 AD. They have successfully tried various genres of music. Their songs, like "Nepali," "Sambodhan," "Pahilo Junima," "Parelima," "Samjhi Baschu" and "Chudaina Timro Mayale" amongst various others, were some of the biggest hits in Nepalese music. The song "Nepali" from their highest selling album Satabdi has been received as the most patriotic songs till now.